The Nile, a river 6178 kilometres long emptying into the Mediterranean is, with the Amazon, one of the longest rivers in the world. It is the result of the meeting in the Sudanese capital Khartoum of the Blue Nile, of which the source is in lake Tana (Ethiopia), the White Nile, from lake Victoria, and the Ethiopian river Atbara. Its average flow rate is 2830 m³/s. Including the White Nile and the Blue Nile, the Nile crosses Egypt, Sudan, Uganda, the Congo, Kenya, Tanzania, Rwanda, Burundi and Ethiopia. 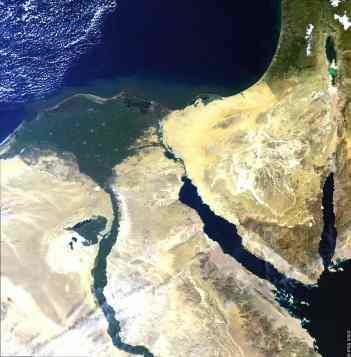 For a long time, the source of the Nile remained a mystery. This was because its many tributaries made any attempt to estimate its length and determine the most distant source very difficult. Its length, estimated for a long time to be 6611 kilometres, was established at 6718 kilometres in March 2006, after a team of explorers discovered its furthest source, located in the Nyungwe forest in Rwanda. The Nile: with the Amazon, one of the longest rivers in the world.